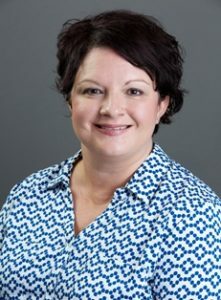 QUINCY, IL – Robin Seaver, Histotechnician with Quincy Medical Group (QMG), was recently elected to the position of director for the American Society of Mohs Histotechnology (ASMH) Board of Directors. Her term will begin following the ASMH Annual Board Meeting on May 4, 2019, in Baltimore, Maryland. Prior to being named to the Board of Directors, Robin served on the planning committee for the organization’s annual meeting for the past two years. Robin works alongside Dr. Sumul Gandhi, Dermatologist, with QMG. Mohs Micrographic Surgery is offered at QMG and is a specialized microscopically controlled technique utilized to treat the most common forms of skin cancers. It allows skin cancer to be removed with less damage to the healthy surrounding skin while also minimizing the chance of any recurrence. The ASMH is a membership organization of 450+ skilled technicians who process the slides used to determine the amount of tissue removed during the Mohs micrographic surgical procedure used to treat skin cancer. The ASMH is an ancillary group to the American College of Mohs Surgery (ACMS), which is a membership organization of fellowship-trained skin cancer and reconstructive surgeons specializing in Mohs surgery. The ACMS, founded in 1967 by Dr. Frederic Mohs, serves as the voice of the specialty, promoting and advancing the highest standards of patient care through fellowship training, research, education, and public advocacy.